The last time when I went to the computer shop to inquire about the latest prices of laptops, I was told that the new laptop had the Intel fourth generation processor. I asked the person the difference between first generation and the fourth generation but he was unable to answer properly only saying that the fourth generation was faster than the 1st, 2nd and 3rd generations. So I came home and wanted to know about the philosophy of processor generations on the Internet. To my astonishment, there was no complete guide available which could tell clearly about the Intel processor generations and their differences. After researching a lot, I have enough knowledge that I can write and document the differences which I have found in this article. First of all, many people think that Core i3, i5 and i7 are the processor generations. These are models or brands of processors from Intel. I will write another article about these later as it requires a lot of discussion. Let me list down all the major processor models released by Intel. The concept of generations mainly comes after the released of Core i series. The difference in processor micro-architecture is the main difference in processor generations. We will discuss about these generations in detail below. Intel processor generations is simply have the enhanced feature set and speed than the previous generations. Let’s discuss each generation separately. Nehalem was the Intel processor micro-architecture which was successor to the initial Core architecture which had certain limitations like inability to increase clock speed, inefficient pipeline etc. Nehalem used 45 nanometer process as opposed to the 65nm or 90nm used by previous architectures. Nehalem reintroduced hyper-threading technology which was left out mainly in the initial Core i3 processor models. The Nehalem processor has a 64 KB L1 cache, 256 KB per core L2 cache and 4 MB to 12 MB L3 cache which is shared with all the processor cores. Sandy Bridge micro-architecture was introduced in 2011 to replace Nehalem architecture. Sandy Bridge uses 32 nanometer process as opposed to 45 nm used in Nehalem. Sandy Bridge processor average performance enhancement as compared to Nehalem was about 11.3%. Sandy Bridge uses the same 64 KB L1 cache and 256 KB per core for L2 cache but the difference is in the L3 cache. Normally the Sandy Bridge processor L3 cache was from 1MB to 8 MB. For extreme processors, it was from 10 MB to 15 MB. Ivy Bridge processors are faster than Sandy Bridge processors and use 22 nanometer process as opposed to 32 nm used in Sandy Bridge. This processor model consumes up to 50% less energy and will give 25% to 68% increase in performance as compared to Sandy Bridge processors. The only problem with Ivy Bridge processors is that they may emit more heat as compared to Sandy Bridge processors. Haswell is the latest generation processor which is released by Intel. It uses the same 22 nm process like Ivy Bridge. The performance improvement of Haswell as compared to Ivy bridge is from 3% to 8%. Haswell carries a lot of features from Ivy Bridge with some very exciting new features like support for new sockets (LGA 1150, BGA 1364, LGA 2011-3), DDR4 technology, a completely new cache design etc. The main benefit of Haswell is that it can be used in ultra portable devices due to its low power consumption. After Haswell, Intel is working on 14 nm and 10 nm architectures which is to be named as Skylate. Skylate will has support for PCIe 4.0, DDR4 SD RAM, SATA express and advanced vector extensions 2.2. There is no official word on when Skylate will be released but it is expected to land somewhere in 2015. I hope the article will give some insight about the processor generations. I would love to have your view about this and if I have missed any features of any generation, it would be great to hear from you in the comments. How about 5th,6th & 7th generations of i3 processor? What about their names? How about an updated article? It’s 2019. Thanks. @SPB For sure. We are working on updating the article up to 8th Generation. What is the difference between i3 -6’th gen and 8th gen? being a tech idiot. I cannot under stand what you have written. My question is still what difference is there to the average purchaser between 1st 2nd 3rd or 4th generation of Tablets. It would be nice to see this article updated to include the most recent processors. The laptop I just bought this past week has a Core I-7 Generation 8 processor, so there is more information to be catalogued. sir what is the difference b/w core i7 and core i7 quadcore processor? This list as jut about anything I can find online does not give a list of CPUs by generation. This is a critical list because when buying CPUs you must marry the CPU with a motherboard that can support them. Motherboard support is by CPU generation for the Intel processors. Therefore, I need to know the exact CPU model number and what generation it belongs to. The best list would be by generation, giving all the CPU model numbers that are in each generation. But if you give me a list simply by CPU model number, I can always use Excel and reorder them into the generation group. wish you could tell us how to identify the generation of a processor – it is, IMO, more useful than know the weird names given to them. Will i7-8700 be the 8th generation? because of the 8 in 8700? I am in small confusion, i need to buy a new laptop. but i saw two laptops, one is i5 processor 7th generation, and another one is i5 processor 8th generation. Can you please let me know which one is best? 7th generation of computer is working fine from progressing time and 8th generation is new in market. You should compare the both laptops with clock speed, ram cache size, HDD RPM and with more configurations. Happy New Year. Please update. Also please create a graphic showing the performance of each generation (you could use typical frequency for each generation if the same frequency is not used across all generations). Also, another graphic showing the energy consumption for a mix of tasks. A table summarizing everything would be great. Thank you. I shared my leptop detail with friends the one of them ask me ” which processer in your leptop?..and which genration? “… my answere was i-7 GEN and processer is also same… i’m confuse to answere it… if possible you can tell me this in briefly …. i7 is processor model after the model name you will have 4 digits. first one indicates which generation and the rest indicates the speed. This gaves me idea to all those generation thing.. u help me decide what to buy, coz I was about to purchase a computer set..
Sharjeel what type of information do you need? The article seems outdated. I’m updating it right now to reflect the latest changes in processor generations. Yes the article is outdated, kindly update it. It is really helpful. Thank you and God bless. I have an i7 2nd gen. Considering upgrading to maybe a 6th gen. Is it worth the upgrade or no? I dont want the expense of a new 7th or 8th gen machine. If my memory serves me correctly. Intel’s first PC processor was the 8086 (often referred to as the AT) followed by the 80186, 80286, 80386 80486 (referred to without the 80 prefix eg 286) then came the pentiums. thanks for your explanation. till i read this article i was thinking that there is vast difference in working of the system because of the generation change. its not as simple as replacing the processor to upgrade. since these processors support different ram eg ddr 4 ddr3 , also the motherboard needs to be replaced since the CPU architecture is not supported on all motherboards .so yiu need to do some research first. hey like someone said previously there are more generations out now and we would like you to continue the article and compare the 5th, 6th, and 7th generations of the intel core thanks for the well need article that listed all and only information listed. Thank You Very Much That Is Much Helpful For Me. Currently there are more generations now available 5th 6th 7th and counting. I believe that 4th generation was the best one (Hasswell). Great Explanation by the way. Currently there are more generations now available 5th 6th 7th and counting. I beleive that 4th generation was the best one (Hasswell). Great Explanation by the way. In list of early processors, I don’t see the ‘Pentium Pro.’ I remember that it was highly rated at the time. I have one in my computer junk pile. Good article. Thanks for doing the research! Fantastic. It Really helps and very brief intro. Now we will have much idea when we will go to buy new laptops. Thanks once again. 1st Generation of Intel Processor is 8086 Following 8088.
your work is very fantastic, i appreciate you for that. please i have been asked to write a term paper, comparing the various generation of intel and motorola processors. please i need your assistance here. I want you to help help write a work on this topic. thank you. Nehalem was actually a fourth processor series to use 45nm production process. Previous architectures using it were Core 2 Duos: Wolfdale (2 cores mostly), Penryn (mobile, 1 to 4 cores) and Yorkfield (4 cores). First of these were introduced about a year before first Nehalem. I still use some of them. Thanks, a well compiled article, very useful to know about the various generations. I want to purchase the laptop,so went through the both DELL and HP website model Inspiron 15 5000 Series and HP 15-AC646TX (V5D74PA) have same specification except processor in dell it have 6th Generation Intel® Core™ i5-6200U Processor (3M Cache, up to 2.80 GHz) and in HP 4th genaration Intel Core i5-4210U 1.7 Ghz and cost for HP is 45000k and for DELL 55000k so sugesst me which one is best? Its Best. Always go with higher Speed. This is a very beneficial document,Now i have a knowledge about processor models and generations. 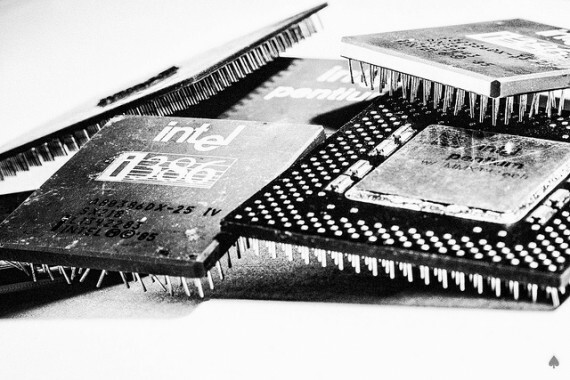 Really useful article to understand generations of the processors -thanks. Good summary. Thanks for the info! I had the same trouble finding a good walk through the Intel generations. If I were you, I would prefer 4th gen Core i5 processor. So if I have a third generation Core i7 in my laptop, could I buy a new laptop with a fourth or fifth gen i5 chip and still have superior performance? checkout the processor performance charts at passmark.com. select “benchmarks” then “cpu benchmarks”. you just might find a new i5 beats an old i7. but if the performance is similar, is it really worth upgrading? Thanks for your nice article. You mentioned that “The only problem with Ivy Bridge processors is that they may emit more heat as compared to Sandy Bridge processors.” How about Haswell processor–Does it also emits more heat? Thanks for your clarification. As far as I have read in different forums, Haswell also has problems with heating the CPU but haven’t done any experimentation on that. which kind of generations are they? I asemble a new PC (desktop) i3 (i3-3210) third generation in februry. I am confuse about AMD and Intel processor I have no time research so I go to intel. But after 6 months I discover AMD is better for small office and daily works, some time I feel its better then intel. I want your opinion or post about it. Azharuddin, I am still in process of writing about i3, i5 and i7 processors. You can a good idea that I should also write about AMD in addition to Intel. Will definitely keep this in mind.